Current Reading – plus we purchase more (whisper it) full price books! I have decided to dispense with the current reading widget on the side of this page, for a couple of reasons really: firstly, I was constantly having to change it and it will only point at an image already online; secondly (and mainly) because it’s no good when I’m reading more than one book at once! And I am doing this at the moment, despite my reservations about this type of reading, for another very good reason – I found that I was avoiding reading certain books because I didn’t want to commit to them exclusively at the expense of other volumes I fancy at the moment. 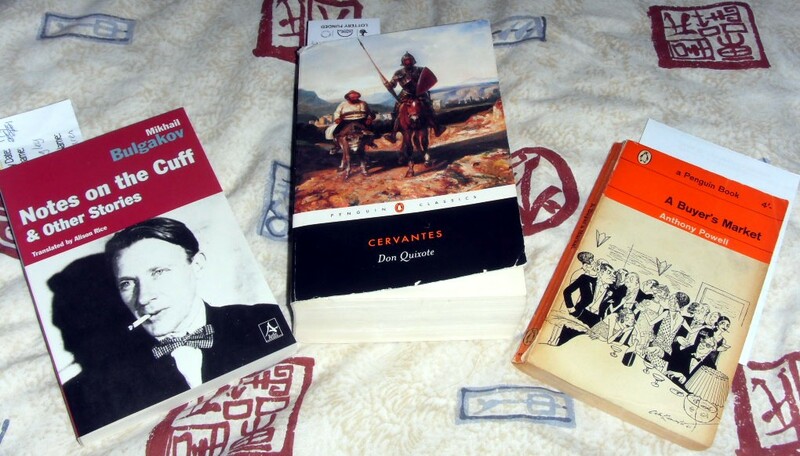 A few words of explanation – “Don Quixote” is a book that’s been TBR for years (actually, decades) and I was spurred on to pick it up by reading of Bulgakov’s love of it (my favourite character from M&M, Koroviev, is often said to be a knight from DQ). Translation and translators came into play here too – I actually have owned for about 20-odd years the Penguin Classics translation by Cohen, but when I did a bit of online research, the later Penguin volume from John Richardson sounded as if it might be up my street. I know there is a more recent, lauded version by Edith Grossman from Vintage, but I read quite a few negatives and when I compared a couple of pages of both versions, I felt the Richardson was for me. I duly procured a cheap copy from Awesome Books (thanks folks!) and I am 100 pages into what is a 1000 page book! It’s actually so far a very funny, very easy read which I’m enjoying a lot, and I’m not feeling at all intimidated by the length as I know I can dip into my other current reads when I feel like it. Secondly is “A Buyer’s Market” by Anthony Powell, no. 2 in my monthly reading of “Dance to the Music of Time”. As I’m struggling with motivation again, it’s nice to be able to pick this up, read a few pages and stop when I want. And so far, this is much easier to get into than the first book – maybe as I’ve got used to Powell’s style and the characters are quite familiar. I may be a little later finishing it, but heck! At least I started it in February….! And finally “Notes off the Cuff’ – simply because I *have* to have a Bulgakov on the go at the moment! In fact, the Bulgakov has changed since I came up with the idea of three books on the go at once – it was “The Fatal Eggs” – because Youngest Child and I headed off to Kent yesterday for a day out visiting another University. Boy, was it cold!!! 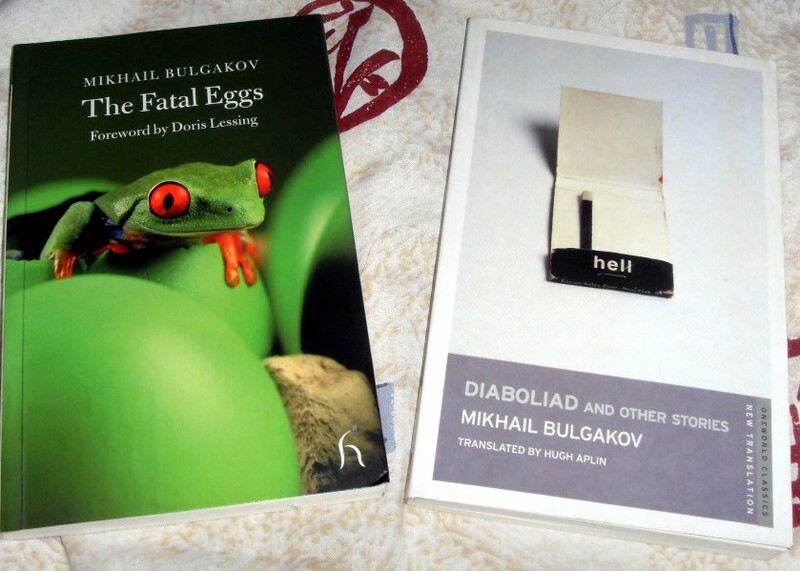 The University was fine, and because we were on the train I was able to read – finished “The Fatal Eggs” and also got through a new translation (Hugh Aplin) of Bulgakov;s “Diaboliad”. I’ll review these together with “Cuff” at a later date, I think. I probably have all the George Orwell essays already in one of my collected volumes, but this one did look rather pretty. 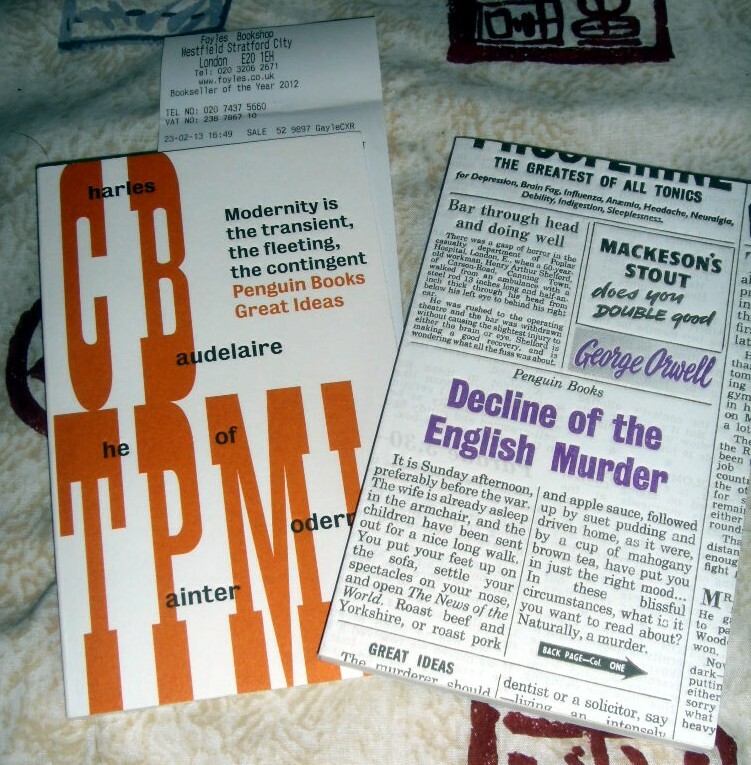 And the Baudelaire book sounded fun as well – so the TBR will now become even higher and more unstable – oh dear!